Also known as the Symmomus Rush-skipper, this fast flying butterfly is common in local bushland, often landing and resting in the characteristic skipper manner (but sometimes with closed wings). 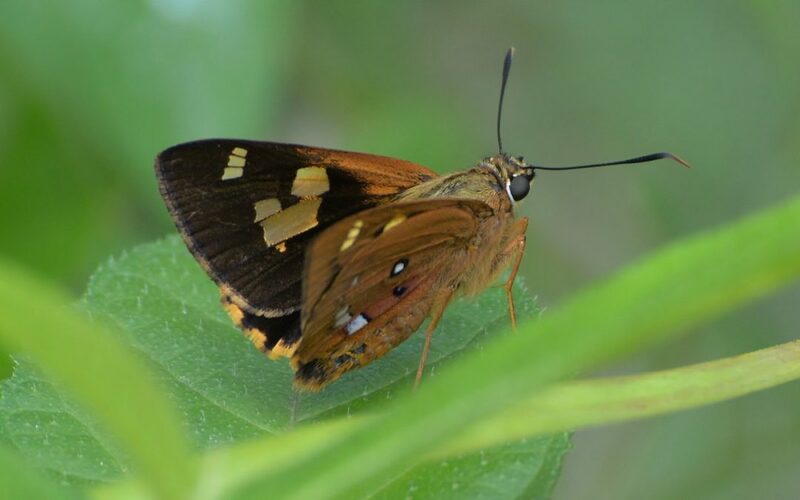 This is one of the largest skippers (wingspan 42–46 mm), with females being slightly larger than males. The upperwing is dark brown with yellowish markings and the underside is paler with white dots. Adults are generally seen from November to April. The caterpillar is smooth and pale brown in colour, and grows to 40 mm. Its favoured food plant is Spiny-headed Mat-rush (Lomandra longifolia), which is found widely in the Samford district, but will also use other lomandras. The caterpillars join several leaves together with silk to form a tight structure for shelter during the day, emerging to feed at night. They usually pupate in leaf litter near the base of the plant. This species was recorded in a 2018 insect survey at the Samford Eco-Corridor (https://www.facebook.com/EcoCorridor).